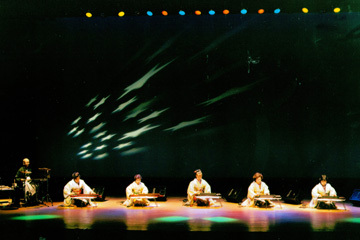 East combines with West in the musical instrument known as the taishokoto. Part traditional Japanese string instrument and part autoharp, the taishokoto dates to 1912 and has many fans, such as former Japanese Prime Minister Toshiki Kaifu. Its inventor, Goro Morita, was inspired by the ordinary typewriter. A school devoted to teaching taishokoto, Kinshuukai Japan, comes to town for a free concert, 7 to 9 p.m. Wednesday at Hawaii Theatre. The group, which has performed at Carnegie Hall, offers a summer concert called "Pop 'n' Trad Japan." Special guests Angel Fish will join the 61 performers, coaxing a bit of pop, banjo music and more from the instrument. Players of the taishokoto, which is part koto and part autoharp, will play at the Hawaii Theatre on Wednesday. Auntie Pasto's celebrates a critical element in Italian cooking with a Garlic Fest, Thursday through July 31 at its Beretania Street and Kunia Shopping Center locations. Menu specials begin with cocktails, a "Scratch" Bloody Mary with roasted garlic garnish. Pair it, perhaps, with Roasted Garlic Soup. House specialties during the festival will be Tuscan Garlic Shrimp Scampi and Slow-Roasted Spare Ribs a la Gilroy (the Garlic Capital, in California). Daily specials: Cheeseburger Meatloaf (stuffed with roasted garlic cloves) on Mondays, Garlic Risotto on Tuesdays, Spinach Gnocchi in Parmesan-Garlic Cream Sauce on Wednesdays, Garlic Half Chicken on Thursdays, Pan-Roasted Fresh Catch on Fridays, Slow-Roasted Lamb Shanks on Saturdays and Pork Chops with Garlic Jam on Sundays. And not to forget dessert: Roasted Garlic Ice Cream. Call 523-8855 (Beretania) or 680-0005 (Kunia). The Mediterranean Gourmet Restaurant has opened in the former Charo's location, at Hanalei Colony Resort on Kauai. The restaurant is the project of the husband-and-wife team Imad and Yarrow Beydoun. Imad, born and raised in Beirut and a veteran of food and beverage positions in Monterey, Calif., moved to Kauai last year and began offering packaged foods -- including baba ghanouj, falafels, hummus and tabouleh -- under the Mediterranean Gourmet label at health food stores and farmer's markets. The restaurant specializes in Middle Eastern standards such as stuffed grape leaves, gyros and kebabs. Cheesecakes, baklava, Turkish coffee and French press teas round out the menu. A belly dancer appears on Wednesday, Friday and Saturday nights. BYOB. Hours are 11 a.m. to 9 p.m. Monday through Saturday. Call 808-826-9875. » Marble Slab Creamery has opened its first Honolulu shop, in the Ala Moana Center food court, offering premium ice creams and mix-ins that are smashed into the ice cream. Franchise owners Steve Ahmed and Mohammed Allwer are also offering cakes, pies, brownies and smoothies. Call 949-9449. » Cold Stone Creamery, already well-represented locally, is offering a $15,000 grand prize for the best "shake-in' it up" dance video, to promote a new line of shakes. Seven regional finalists will be flown to New York for a dance-off. Enter by July 23 via www.coldstonecreamery.com. » For information on tomorrow's taishokoto concert at Hawaii Theatre, call the box office, 528-0506, or visit the Web site www.hawaiitheatre.com. An incorrect phone number was printed on Page E1 Sunday.